Rich in protein, the boiled egg and potato snacks make perfect recipes of healthy snacks. Enjoy the high nutrients boiled egg potato snacks and bring smile on your kids face. 1. Cut bolied eggs, tomatoes and boiled potatoes in a small dice. 2. Heat oil in a pan. Add Kalonji. 3. Now add the potatoes, green chilies, salt,black pepper powder and toss it. Mix everything well. Cook for 2-3 minutes only. 4. Now In a plate mix the boiled eggs, tomatoes and light fried potatoes mixture. Sprinkle the Chaat Masala over it. 5. 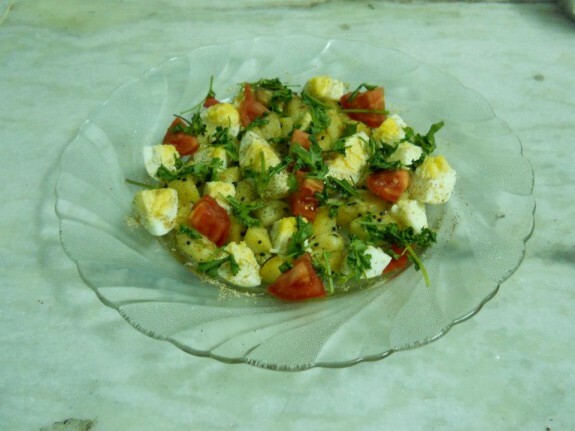 Garnish the Snack with chopped coriander leaves. Note: If you want, you can use ½ tsp lemon juice on this too.